Fungal infections in the central nervous system have been known to lead to significant morbidity and mortality. Most of these infections are chronic and develop in patients with altered immune response. 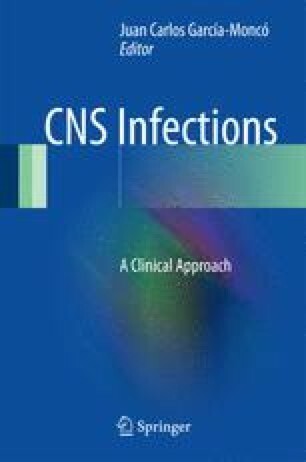 The most common predisposing factors for fungal CNS infections are HIV, organ transplant, tumors, prolonged antimicrobial therapy, chemotherapy, and long-term use of ventilators and catheters. The most common fungal pathogens are Cryptococcus spp., Candida albicans, Aspergillus spp., Histoplasma capsulatum, Coccidioides spp., and Zygomycetes. Occasionally there are serious outbreaks of rare fungal infections that affect also immunocompetent subjects, bringing to focus the enormity of unknown fungi that pose a threat to humans. The diagnosis is often difficult and the treatment options are limited. Hence, the prognosis of these infections is poor with high morbidity and high mortality. This chapter will discuss the most common fungal infections of the CNS and their challenges. This work was supported by National Institute of Health (NIH) awards AI56168, AI71142, AI87541, and AI100631 to MDP. Maurizio Del Poeta is a Burroughs Welcome New Investigator in the Pathogenesis of Infectious Diseases. The authors have no conflicts of interest that are directly relevant to the content of this review.